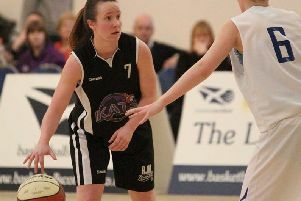 Caledonia Pride also suffered a damaging loss in the British Women’s League despite a spirited fightback against London Lions. Kings ended 2018 by conceding 129 points to Newcastle Eagles in the BBL Trophy, but they made a flying start to the new year against Falkirk in Grangemouth as Konrad Kantorski drained an early three-pointer. It was 24-18 to the visitors at the end of the first quarter and Ali Mackay’s basket kept them ahead at half-time. The lead grew to ten points, but Fury had reduced it to two going into the final quarter. Kings were still in front with seven minutes remaining, only for a late collapse to hand the home side an 88-79 victory. Champions St Mirren and unbeaten leaders Dunfermline Reign also won, leaving Kings down in fourth place. Boroughmuir Blaze remain mid-table after beating Edinburgh Lions 97-54 in a local derby at The Crags. 16-year-old Ryan Nealon-Lino contributed 13 points as Blaze dictated terms from the outset. Edinburgh University went down 75-57 at Glasgow Storm. The University’s women’s team fared much better when they travelled west and repeated last month’s Scottish Cup semi-final victory over Glasgow Fever. This time the students won 68-39 as they continue to count down to next month’s Cup final against City of Edinburgh Kool Kats, who also enjoyed a successful weekend. The defending league champions overcame an early deficit against Falkirk in Grangemouth and went on to win 61-39 with Tracey Phillips scoring 14 points and captain Emma Findlay adding 12. Kats are still off the pace, however, after leaders Lady Rocks won again. Polonia Phoenix lost again as West Lothian Wolves prevailed 64-42 at Gracemount High. 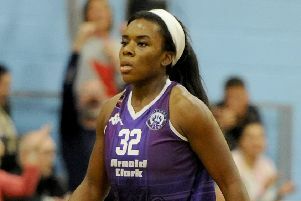 Caledonia Pride had hoped to take another step towards the WBBL play-offs when they welcomed London Lions to Oriam on Sunday, but the visitors blasted out to a 12-point lead entering the final quarter. Although Pride twice closed to within a point, five missed free-throws proved fatal as they lost 61-58. Tia Weledji was back on form with 22 points plus nine rebounds, but to no avail.